Potatoes with Pesto, Thyme For Cooking sides for summer. 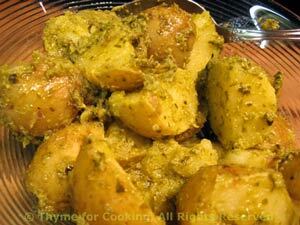 Warm potatoes, tossed with a bit of pesto sauce, make a delicious side dish with grilled meats. And, as they really shouldn't be piping hot, they can be made a bit ahead, reducing last minute stress. When boiling move cover so it's ajar else the potatoes will boil over. They will, I promise. Remove from heat when done (stick a knife in and test - should go in easily), 15 - 20 minutes. Immediately toss with olive oil. Let rest for a few minutes, then add pesto and toss to coat.